A rare hand colored 1853 coastal chart Sabine Pass, Texas. Sabine Pass forms the outlet of Sabine Lake into the Gulf of Mexico and creates the border between Texas and Louisiana. Includes detailed depth soundings, the location of a proposed light house, and sailing instructions. 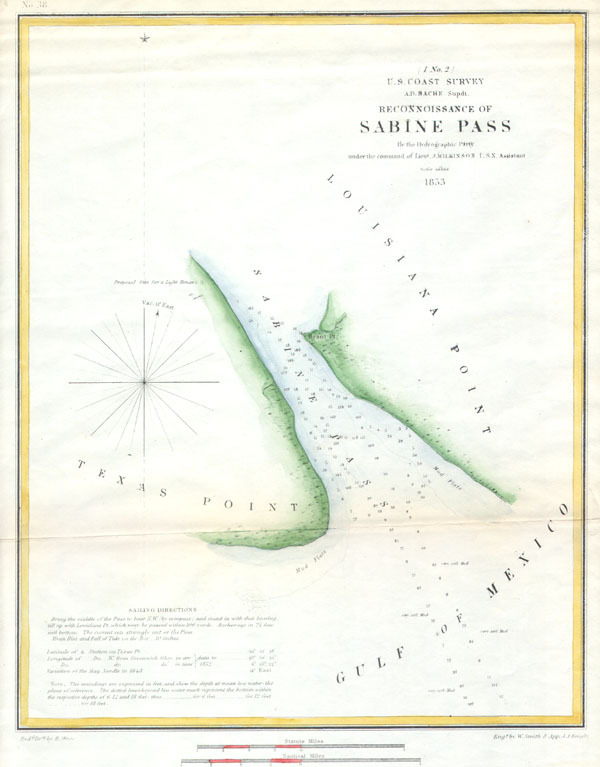 Published under the supervision of A. D. Bache for the 1853 Report of the Superintendant of the U.S. Coast Survey. Very Good condition. Blank on verso. Good margins. Minor discoloration on original fold lines. Phillips, Philip Lee, A List of Maps of America in the Library of Congress, p. 785.